Is Google a threat to media agencies? 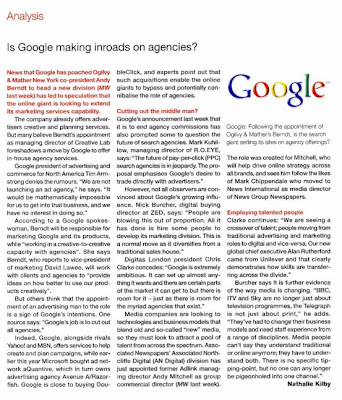 "News last week that Google had poached Ogilvy & Mather New York co-president Andy Berndt to head a new division (Marketing Week, 19th September 2007) has led to speculation that the online giant is looking to extend its marketing services capability." Nick Burcher says: "People are blowing this out of proportion. All it [Google] has done is hire some people to develop its marketing division. This is a normal move as it diversifies from a traditional sales house." Nick Burcher says: "it is further evidence of the way media is changing. BBC, ITV and Sky are no longer just about television programmes, the Telegraph is not just about print. They've had to change their business models and need staff experience from a range of disciplines. Media people can't say they understand traditional or online anymore, they have to understand both. There is no specific tipping-point, but no one can any longer be pigeonholed into one channel."